Last month, when we released the poster for our film Fed Up, the prominently featured initials F and U made it an instant controversy with the Motion Picture Association of America. Less controversial, almost an after thought, was the tagline on the poster "Congress says Pizza is a Vegetable." That wasn't considered a controversial statement for the MPAA, or anyone else, because it happened to be true. Those six words illustrate the food lobby's stranglehold on Washington, DC. You passed a law classifying pizza as a vegetable and you barely got any pushback. It quickly became old news. Maybe Americans are numb, in a food fog. Maybe you were counting on that. Now you're at it again. This week I read that over 40 members of Congress are trying to weaken the school lunch laws even more. What we are feeding schoolchildren around the country is unconscionable, and you want to make it worse? Schools should be a healthy "safe zone" for kids but instead they are "a 7 eleven" with books (as Dr. Kelly Brownell says in Fed Up). 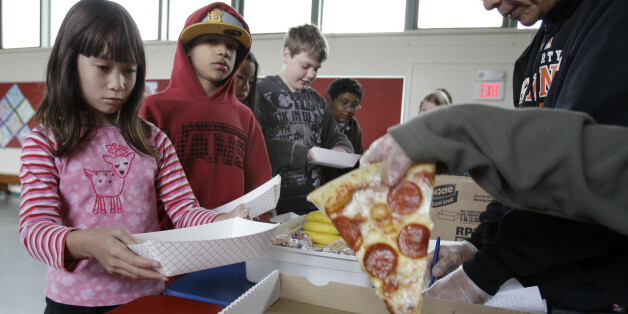 The attempts of some in Congress to scale back key parts of First Lady Michele Obama's school lunch reform is nothing short of a huge F U to America's school kids and their parents. On many things, this country is divided. We have fierce debates about government and regulation, but none of us want our kids in the crossfire. I don't think any of us would disagree that if we want healthy, active children we have to feed them fresh cooked real food for their lunch. Just like we did thirty-five years ago. Many of you in Congress have children and grandchildren and you cherish their futures. You wouldn't allow ideology or ambition to get in the way of protecting them, would you? Well, you're doing just that with America's school kids. The food and beverage industries are running wild, pushing every boundary to imprint their branding on kids from the time they're toddlers. Once those pathways are set, they generally last a lifetime. Corporations turn our kids into sugar addicts. Have you been in a supermarket lately? A drugstore? A middle school? A college campus? Every consumable item laced with sugar available 24/7. It's in the baby formula, the breakfast cereal, the granola bar, yogurt and fruit juice. The amounts of sugar are hidden under pseudonyms, and measured in hard to fathom "grams" purposely to confuse people. It is making American kids sick. And you, Congress, are letting it happen. As Dr. Harvey Karp, the trusted pediatrician of "Happiest Baby on the Block" says in Fed Up, "if another country was doing this to our kids, we would go to war!" It doesn't have to be this way. Years ago, Congress took on cigarettes and seat belts. You recognized the danger and acted in the public interest. Read the daily reports on childhood obesity and type 2 diabetes. At our current rates, by 2050, one in three Americans will have diabetes. Do the math. The health care costs are going to bury this country. Who will be our first responders? Who will be fit for military service? Surely you recognize that danger. When will you act? Eight years ago this month, An inconvenient Truth was released in theaters across the country. This week the headlines informed us that the Antarctic glaciers are irreversibly melting and congress is still just talking. The irony is not lost on me that as Fed Up hits the theaters, the warning for America, for our children is just as loud and clear. Please for the sake of the country do not let another eight years go by, before you heed this warning and start protecting all our kids.